Autumn is passing here in Melbourne, and the golden leaves that began falling from our trees here a couple of months ago are now reduced to a handful of stayers that will last a few cold-snaps before succumbing to the winter air before falling off. I’ve been feeling aimless of late. I’ve got near 30,000 words down on my ‘Epiphany’ story, and created a some very solid characters and a compelling plot. Writing a novel can be a powerful thing, as you quickly find yourself creating a rich and dense world that exists only in your mind. The downside is that the two worlds – the one outside your eyes, and the one viewed with your mind’s eye, have to live in parallel with each other and will fight for your attention. While outside Melbourne is darkening early and the air growing cold, inside my mind is a version of Hong Kong set in the future, that is plagued by the complex politics of warfare and refugees. The issues in this world are a reflection of the refugee issue that is unfolding here in Australia, so it is sometimes hard to split the two worlds apart. Each seem to hold a mirror up against the other as you move between them. But my writing has stalled. I can’t even find myself picking up a typewriter and writing to friends. My time for reading blogs has withered as my demands of the outside world my mind become taxing, as I struggle personally with a work environment that was brilliant last year, and but feels dashed upon the rocks of time this year. Turmoil is not my friend. I feel strained and sad. So I sought solace. I turned the engine of my car and headed to the suburb of Carlton. I went there seeking inspiration. I set myself a mission to collect something. A food steamer; a piece of cooking equipment. Sadly closed on the day I visited, Tom’s typewriter shop has recently seen a boom of business. Pushed to the back are the copiers and printers that were the staples of his work till recently, and now he’s got a display of iron writing machines in the front window. Including a Remington 11…. WOW! The shelves are now filled with machines, and even the floor space is starting to fill up with typewriters that are being repaired. Business is good in the 21st century. The refugee issue and its clash against national identity is one of the core themes of the book I am writing, and seems to be confronting me everywhere I look. These posters were gracing an alley in Carlton that I walked past. I’ve seen them elsewhere, but pasted against this wall in a suburb known for the Italians that made it their home after the Second World War just seemed to just the perfect place for them. They’re wonderful challenges to what we consider the Australian identity. Recently the world of my past caught up with me. My blog post wishing farewell to the Royal Children’s Hospital was discovered by some former workmates that I hadn’t shown it to before. Within 40 hours it had been shared read 2,300 times. Since then exceeding 3000 times. My recollection was that the Hospital in Brisbane only had 1400 people working there when it closed. At around the same time my blog post about Chungking mansions was referenced on the front page of the Chungking mansions blog site. As it was a typecast, I was surprised to find a large chunk of my text has been transposed into searchable text for their blog, with it referencing back to my own site for the rest. Again, my blog found an unexpected audience as tourists around the world started falling onto my page. Professor John Pearn also fell upon my blog unexpectedly last year. Professor Pearn is a medical scientist, and has written many papers and books. He stumbled onto my post about the Royal Children’s Hospital, and then promptly chased me down at my current place of work. Walking across the car-park to my current hospital one afternoon I received an unexpected phone call from the communications department telling me that a man that I’d never met personally before was eager to get in touch with me. He was seeking to use some of my photos for a paper he was writing for the Queensland Historical Society (Queensland University I believe), on the closure of the Royal Children’s Hospital. My photographs are now becoming part of the record of history of Brisbane. As I read the comments on Facebook about that same blog as former workers shared my farewell post across the internet, people spoke of their tears of reading it, while others thanked me for the lovely journey around a world that now only exists in our past. I felt humble, and I felt what I had created was inadequate for the praise I’d been given. I felt overwhelmed by the comments, but grateful that I had been able to contribute to the happiness of others with my words and photographs. It’s a feeling that is hard to describe. When we talk about what makes the identity of a person, seeing these streams that lead to making what drives the emotions of that person is impossible. We know they are there because we all have them, but as we can’t see them, we can’t see why it has driven them as it has. The world inside them is always bigger than their physical existence. As this transpired, I soon found myself being pulled into the world of my past, the world of my mind and the world of my current path. Elements of all of the above made me wave through moments of elation, anger and sadness. On Lygon street, a couple of shops away from the cafe that Teeritz once worked at, is a bookshop that has been a favourite of mine for many years. Even while I lived in Brisbane, I would visit this store whenever I graced the roads of Melbourne again. Readings bookshop has a magnetic atmosphere that always pulls me in. I often dream of finding my own stories here. A dream that is unlikely to become realised. But there’s never been anything wrong with dreaming. Sometimes you just need to take the time to dream. Other times you need to take your dream and give it time and air. Bookshops like this are full of such dreams that have been pushed into the shape of a world, then filtered down onto a page. Perhaps by minds that were often torn between two worlds like I feel my own has been. These books. You could call them wonderful lies or paper transporters. But they therein contain many things communicated that will allow you to slip through doors and into other places within your own mind. It turns out that I’m not the only person who finds this bookshop to be a marvellous place. The London Book Fair this year announced the Carton Readings store as the ‘best bookstore in the world‘. I acquired a warm beverage and observed a world lost between the falling leaves around me. As the last of the leaves were falling from the trees I saw them for the reflections of past that they were. It always is a beautiful time of year. But I wasn’t lost in thought. I was clear and present. Maybe I found the inspiration I wanted. I certainly felt the love towards my typewriters again and the books that they can create, even if it was only momentarily. Maybe I will get back to it again soon. There’s people that matter that need to be written to. There’s people I love that need my attention. There’s worlds in my mind that need feeding. The monsters inside are hungry. But I got my steamer. 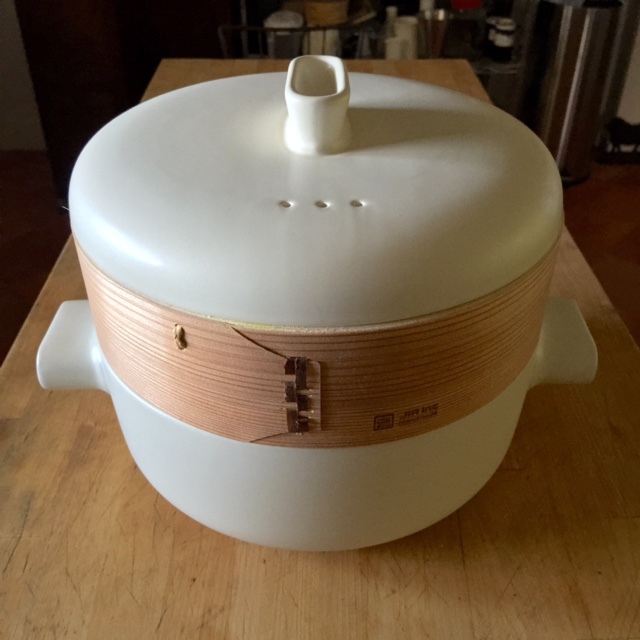 The beautiful Jia steamer that is made in Hong Kong and painfully hard to get hold of in Australia. Probably a little like me at the moment. And as winter begins to bite, the warmth of the lovely steamed food that will come from it might just be enough to feed the monsters of my own soul. My happiness, and fade my discontent. Well just to cheer you up, our summer is just beginning. Two hot days in a row! Nice bit of writing, Scott.